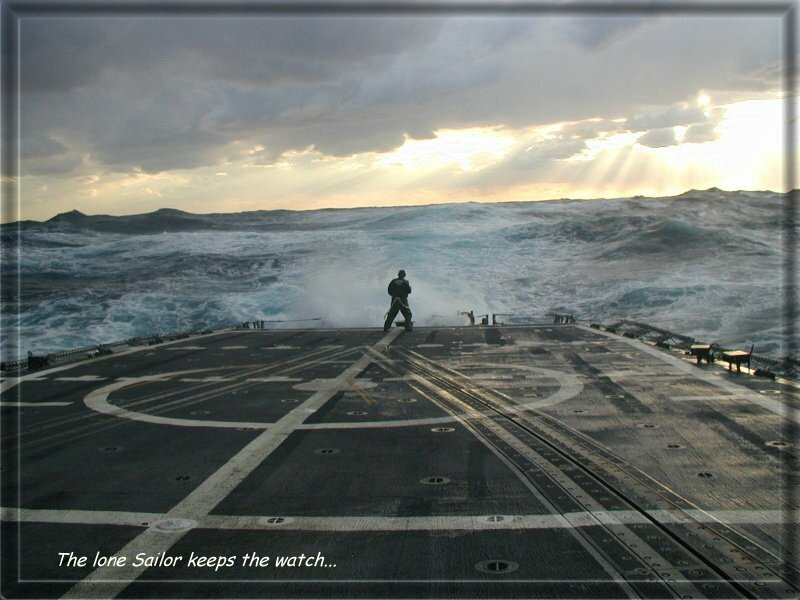 Click here for an eloquent glimpse of what is on this sailor's mind as he stands his watch. 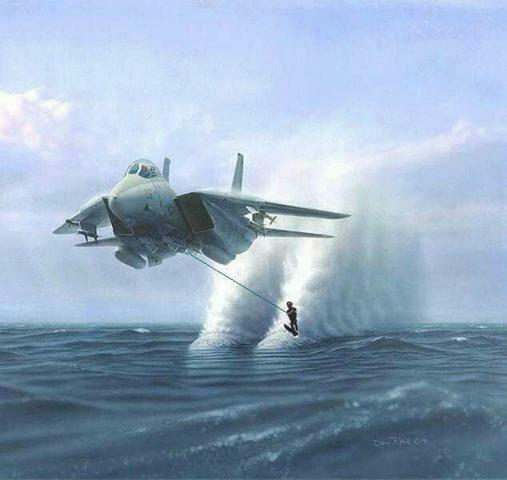 For a look at what our aviator friends are doing while this dedicated sailor stands his watch on the pitching and rolling deck of a Destroyer, click here. 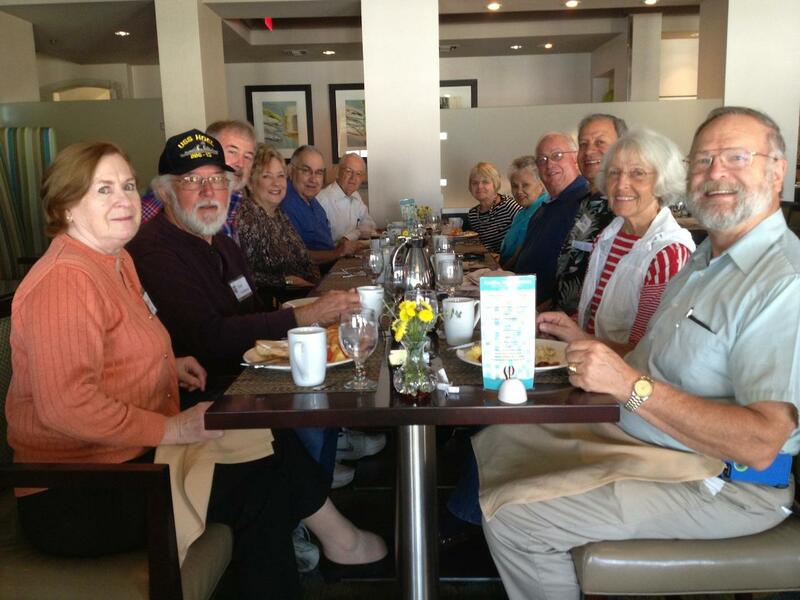 The 2013 Reunion of the USS HOEL Combat Wardroom was held in San Diego 18th, 19th, and 20th of October and a great time was had by those were able to attend. It is high time this web site came to life again and the reunion is a good reason to do so. Pictures and stories of the reunion will be coming soon. We will hopefully keep the site alive and publish plans for the 2015 reunion that we all agreed should happen. Please stay tuned. Friday Night Cast of Characters (left to right): Tom Lettington, Dave Arterburn, Mike Cottrell, Art McAllister (front), Mike Mullert (rear), Dave Craig, Don Hershberger, Scott Gordon (front), Todd Creekman (back), Dave Etherton, Mike Moffett, Mason Truluck, Ed Romo (front), Jim Rieb (back), Loren Page. Not pictured: Admiral Rich Fontaine left early. Rich Beggs arrived late. 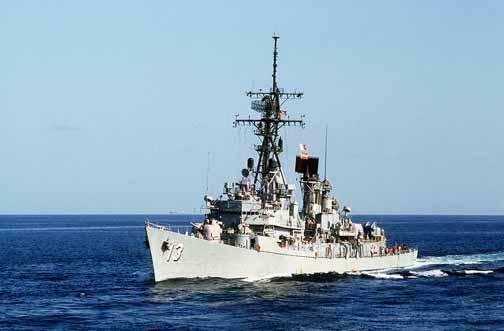 Todd Creekman presented an excellent slide show of the history of USS HOEL at our reunion. The PowerPoint is available here. The script he used to present the slide is here. Todd also provided a table of key events in the career o four ship from keel laying to decommissioning. That table is located here. A set of reunion photos provided by Todd Creekman are found here. Mason Truluck provided a set of 42 informal photographs taken at our 2013 reunion by Barbara Woodbury. Click here so view them for free, download them, or order printed copies from Shutterfly. 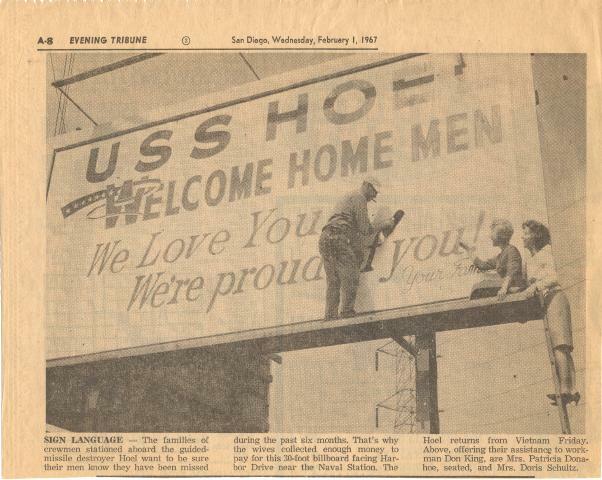 The Ladies welcomed us back with open arms adn a fancy billboard when HOEL's Third WestPac cruise ended on February 3rd, 1967. The CO at the time was Commander Tommy Groves and the Executive Officer was Lieutenant Commander Oscar E. (OE) Sanden. That's Mrs John (Pat) Donahue on the platform and Mrs Peter (Doris) Schultz on the ladder. Jim Reib found this nice little photo on Hullnumber.com .